For the past few decades there has been a regular Wednesday Night Paddle, sponsored by CCA originally. We usually start around May, (weather and water levels permitting) and continue into September’s early sun downs. Normally, we do Angler’s to Lock 10 (first lock inside the beltway, Maryland side for you newbies), sometimes the Violette’s Lock loop, and then Little Falls in late summer when the gauge gets below 2.8. We meet at 5:45 PM , preferably a bit earlier (at Lock 10), to consolidate boats, then leave there at 6 PM to put in at Angler’s by 6:30. This is usually a class II+, practiced novice run, ideal for people who have just started or have taken a beginners class. 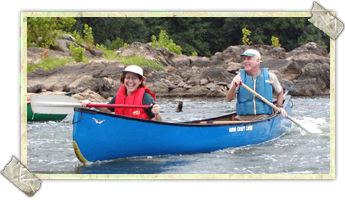 You do not have to belong to a club to come, but we will encourage you to join one (Canoe Cruisers Association, Blue Ridge Voyageurs, Monocacy Canoe Club).You need basic safety skills such as some degree of boat control, ability to wet exit, and a willingness to follow occasional directions. All need to wear PFDs and helmets. Boats should have air bags to facilitate recovery. Throw bags, cell phones, flashlights, and whistles are nice. There are usually quite a few experienced boaters willing to teach you some stuff and rescue you (and me) if needed. I post the plan for each week on the Monocacy Canoe Club message board Paddle Prattle late Tuesday or early Wednesday. I sign as “Mikey B”. If you are new to the Potomac, you will find that most of our paddling access points are on the Maryland side of the river. This is thanks to the C&O Canal National Park which runs for 184 miles along the Potomac from Georgetown in Washington, DC, to Cumberland, Maryland. The C&O Canal Association has a list of all the access points with descriptions, coordinates and Google map links. Please contact the trip coordinator before heading out for a trip. Rain or the lack thereof e have , resulted in high water (or very low water) and have caused many trips to be cancelled or relocated.